A 1-year membership is included for one account with any EyeQue at-home vision test purchase! Test as often as you want. EyeQue devices travel well, so test anywhere, anytime, storing results instantly as long as you’re connected to the Internet. Your test results and stored data are always available on your personal dashboard at eyeque.com. Be among the first invited to try new products and services with special members-only offers. As an active All Access Member, you’ll be able to test your vision as often as you want the Personal Vision Tracker or VisionCheck, all year long. You’ll have access to your records stored in the EyeQue Cloud and you’ll be among the first invited to try our new products and services with special members-only offers. 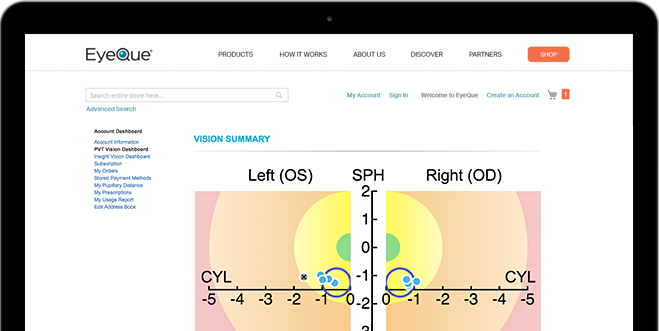 Visit eyeque.com anytime to compare your test results, upload prescriptions, and view your personalized report.